You can easily experience true weightlessness at home, in your back yard, or at the local park. Prepare two objects that look and feel the same but have different weights. For example, get two small food cans, one filled with food and the other one empty. Cover the tops with paper or foil so that they look the same. Or, instead of cans, you could use two plastic containers, one empty and the other filled with sand, both covered with paper. Or you could use an empty eggshell with a piece of masking tape over the hole and a hard-boiled egg with an identical piece of tape. Tie a string around each object. Hang the two objects from the ceiling, side by side. Make sure that the string is secure so that the object won't fall down on your foot. These objects are not weightless. 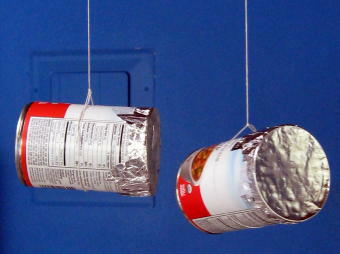 Gravity is pulling them down and the string is holding them up. They definitely have weight in the vertical direction, which you can feel by grabbing and lifting the string. However, in the horizontal direction, they have no weight. Gravity is not pulling on them horizontally, and nothing is holding them horizontally. They are "floating" weightlessly in the horizontal direction. Ask a friend to give each object a tiny, brief push in the horizontal direction. Does your friend feel any difference between the two objects? Even though the two objects are weightless in the horizontal direction, they still have mass, or resistance to change in motion. It's harder to displace the heavier object than the lighter one. Now imagine you carry out this same experiment aboard the International Space Station. In this case, no strings are needed. You place the two objects in front of your friend and let go; they float in place. You ask your friend to give each object a tiny push. Can your friend tell them apart? Yes! 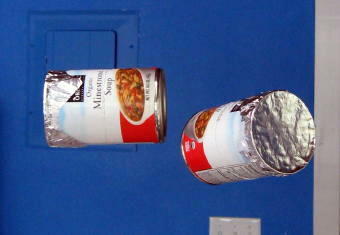 Even though the two objects are totally weightless, they still have mass, or resistance to change in motion. It's harder to displace the heavier object than the lighter one. When you jump off of a picnic table, you are weightless for that entire time that you are in the air, from the instant your feet leave the table until your feet touch the ground. During this brief time, you can do the following weightlessness experiment. Cut down the two objects from the previous experiment and discard the string. Take the two objects outside and find a place where you can jump safely, such as from a picnic table, bench, or low wall onto grass or soft sand. 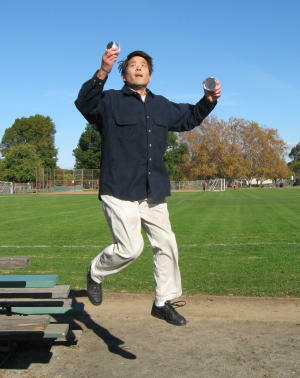 With one object in each hand, jump off of the table, and take note of how each object feels while you are in the air. Try this several times, with the objects held steady (relative to your body), then while shaking them gently, and then shaking them vigorously. Try holding the heavier object in your right hand, then in the left hand, to prevent your right-handedness or left-handedness from biasing the results. Be careful not to drop or throw the objects in a way that could hurt bystanders or yourself. What do you observe about the feel of the heavy and light objects? Do they feel any different during your brief period of weightlessness? Now imagine you are exercising aboard the International Space Station. Will you get more exercise "lifting" the 8-pound weights than the 3-pound weights? The answer is yes. Both the 3-pound and 8-pound weights are weightless, but the 8-pound weight is harder to move. When you move it back and forth with your arms, the 8-pound weight has a greater resistance to change in motion, so you must work harder to move it.